Journey to the Heart of the First Peoples Collections reveals objects of unimagined beauty and rarity. Its pages will bring you into the world of the Aboriginal nations of Quebec, Canada, the United States, Amazonia, and Oceania. 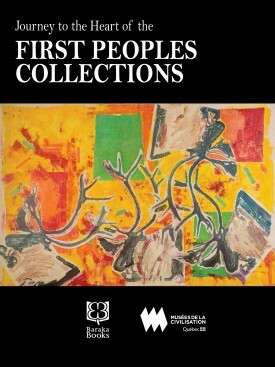 The history of this collection spans a period stretching from New France, with objects brought back by the priests of the Séminaire de Québec from missions in various regions of the Americas, to the present, with the most recent donations by collectors passionate about history and the ways of life of the First Peoples. Let yourself be enthralled by one of the oldest and richest collections in the Musées de la civilisation. Authors include Catherine Bell, Boye G. Ladd, Denis Vaugeois, Denis Gagnon, Guy Sioui-Durand, Diane Dittemore, Hélène Giguère, Jameson C. Brant, Marie-Pierre Bousquet, Douglas Nakashima, Louis Gagnon, Diane Bélanger, Laurent Jérôme, and Christine Leroy. Together they examine how the collections were developed, the nature of the exchanges involved, the importance of building close working relationships between First Nations and museums, the meaning of gift giving, major exhibitions, means to learn and disseminate traditional knowledge, and much more. Marie-Paule Robitaille, Curator of the First Nations and Inuit Collections at the Musées de la civilisation, directed the publication. Before joining the Musée in 1988, Marie-Paule Robitaille was curator of the Amerindian and Métis Collections for Parks Canada, Prairies and Northern Region, and she also managed the Maison Louis Riel in Winnipeg (Saint-Boniface). She holds a BA from the Collège universitaire de Saint-Boniface (University of Manitoba) and a degree in Art History and French Civilisation from the IUT de Larochelle (Université de Poitiers) in France. Glenna Matoush is a deeply committed artist who has earned a solid reputation. Born to a family of Anishinabe (Ojibway) artists in Ontario, she lived for many years with the Eeyou (Crees) of Mistassini. After her artistic training in fine arts, she devoted her time to painting, sculpture, murals, and stained glass, but also began her career in drawing and prints. Her very sensitive work bears witness to her social and political commitment.